Quartzite gravel deposited on mountaintops, ridges, plateaus and in valleys over extensive areas of the northwest United States and adjacent Canada provides strong evidence for the retreating floodwaters of the Recessive Stage of the Genesis Flood. The diluvial framework readily accounts for the wide distribution, up to 1000 km away from its source outcrop areas in the Rocky Mountains. During the Recessive Stage, continental uplift and floodwater division started in western Idaho and shifted eastward. Quartzite gravels were initially deposited on relatively flat surfaces, but these were quickly channelized by water flow from rising mountains into sinking valleys and basins. In this region the Flood/post-Flood boundary, as clearly indicated by the quartzite gravels, is in the ‘upper Cenozoic’. Not only does a diluvial interpretation make good sense of the geological evidence, much better than the inadequate uniformitarian hypotheses that have been proposed, but the Genesis Flood represents the only possible geological process that can account for all the data of the quartzite gravels. Deposits of quartzite gravel are found on mountaintops, ridges, plateaus and in valleys in the northwest USA and the southwest Canada. We have documented many of the quartzite gravel locations that we have either examined in the field or noted in the literature.1,2 From the inferred paleocurrent directions and a general decrease in clast size, it is evident that the quartzites were eroded from the northern Rocky Mountains of central and northern Idaho, northwestern Montana, and adjacent Canada. The Belt Supergroup is likely the main source of the quartzite. From these source areas, the quartzites were transported more than 1,000 km east and 700 km west over what apparently was almost flat ground. 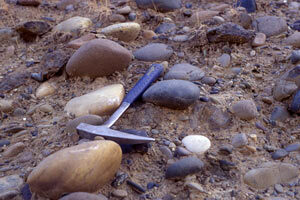 As well as a general size decrease in the gravel, the clasts become well rounded farther away from the source areas. Often the quartzite gravel shows percussion marks and is iron stained. The quartzite gravels range in thickness from a thin lag to deposits over 3,000 m thick east and northeast of Jackson Hole, Wyoming and even to 4,750 m in southeast Idaho near the Montana border. Boulders in these thick deposits, occurring mainly in deep, likely fault-controlled valleys or basins, often have pressure solution marks and are fractured. Gold is sometimes found within the matrix of the gravels, for instance in central and northeast Oregon and northwest Wyoming. We have demonstrated that uniformitarian explanations of these data fail to account for the evidence.3 Of all the hypotheses proposed, fluvial transport seems to be the main one that still survives. However, this hypothesis falls far short of accounting for the extensive distribution of the gravels, the long transport distances, the iron staining and the percussion marks.4 In this paper we show that a diluvial interpretation, i.e. an interpretation based on the global Flood recorded in the Bible, makes good sense of the data—much better than the failed uniformitarian interpretations. Our observation and analysis of these quartzite gravels represents a fifteen-year project, yet much remains to be learned from these and similar deposits. 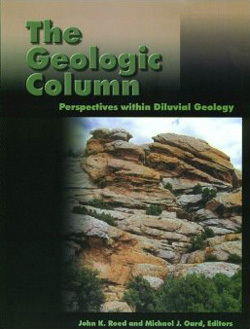 Unlike uniformitarian concepts, the diluvial framework has the capacity to account for the huge distribution of quartzite gravel both east and west of their source outcrop areas, up to 1,000 km on the east side and 700 km to the Pacific Ocean on the west side, away from the Rocky Mountains.6 It provides a ready explanation for the iron patina on the quartzite gravels that we have noticed at numerous locations across the area: they are likely an indication that the denudation of the Rocky Mountains occurred in an iron-rich, watery environment. Within the diluvial framework, the whole area was flooded at the same time with powerful currents spreading east and west of the Rocky Mountains. Figure 2. Schematic of mountain ranges, river courses, passes (wind gaps), and postulated former drainages (dotted pattern) in central Idaho. (After Anderson,4 p. 64). Note that the river courses, such as the Salmon River with generally acute angled tributaries, trend northeast in their upper reaches and then turn westward. We believe uniformitarian scientists are correct that the huge amount of quartzite gravel originated mostly from the area of the Idaho Batholith (figure 1). It is likely that the Belt Supergroup once existed where the batholith now outcrops, and that as the batholith rose the Belt rocks were eroded underwater during the early Recessive Stage of the Flood. The ‘Ordovician’ Kinnikinic quartzite from east-central Idaho, adjacent to the Belt Supergroup, is also considered a possible source of the quartzite gravels.7 (It is possible that the Kinnikinic quartzite is really just part of the Belt but with ‘Ordovician’ fossils.) One reason for this is that the quartzites in southwest Montana, northwest Wyoming and adjacent Idaho originated from near the Idaho batholith, which is now well west of the continental divide. Furthermore, the metamorphic grade of the quartzite gravel on the plains east of the divide is similar to the quartzite outcrops found west of the divide and not east of the divide. 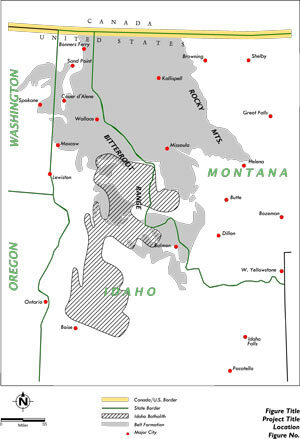 It is likely that the Idaho batholith was the first mountain range to uplift in the region, causing the ‘continental divide’ to temporarily be in this location. Powerful water currents quickly spread the quartzites long distances over a relatively flat surface. This is likely why the quartzite gravels are now found in locations that are separated from the source by one or more mountain ranges, such as the quartzites in central Oregon, those in the Puget Sound area, and those in the Bighorn Basin. Further evidence of this eastward drainage early in the Recessive Stage of the Flood is that the headwaters of the rivers in central Idaho, for instance the Salmon River with generally acute angled tributaries, trend northeast and then abruptly cut back around to the west (figure 2).8 Aligned wind gaps or passes that slice some 1,000 m deep across block mountains in east-central Idaho reinforce the northeastern trend of early Recessive Stage currents. This is evidence that the ‘divide’ was once about 160 km west of its present location, and that it shifted east in ‘late Tertiary’ time (using uniformitarian classification).8 Alternatively, it is possible that the currents shifted from eastward to westward when everything was underwater, without any shifting of the bottom. We have also found evidence that the ‘continental divide’ shifted eastward in the southwest United States.9 The Rim Gravels of Arizona indicate currents flowing northeast, but then the drainage shifted toward the west, causing great erosion, including the formation of Grand Canyon. After the initial uplift of the Idaho Batholith, other mountain ranges uplifted while adjacent basins or valleys sank down. The northern Rockies consist of a number of mountain ranges with adjacent depressions. This activity is in accord with Psalm 104:8. This happened underwater because the quartzite gravels were still spreading away from the Rocky Mountains. One indication of this underwater activity is the presence of marine fossils in the quartzite gravels in northwest Wyoming.10 This is why some quartzite gravels were uplifted and are found on the tops of mountains today, such as on top of the northern Teton Mountains. The uplifting mountain ranges would also have channelized the Flood currents further and initiated the Channelized Phase of the Flood. Thus, currents west of the present continental divide would be diverted and quartzite gravel would flow into some valleys and not others. Some of the sinking basins or valleys would rapidly collect thousands of meters of quartzite gravels, such as in northeast Idaho and east and northeast of Jackson, Wyoming. Figure 3. Schematic from of water running off the Rocky Mountains as the western United States uplifts out of the Floodwaters (drawn by Daniel Lewis). The thick limestone conglomerates of southwest Montana were likely caused by the early denudation of the local area as the mountains were rising in the floodwaters. Some mountains composed only of limestone conglomerate, as well as conglomerate in the valleys, indicate that this conglomerate probably also formed an extensive sheet at one time before erosion dissected it. The quartzite gravels seem to mostly have followed after this denudation in southwest Montana, since they originated in central Idaho. The quartzite gravels occur often independently of limestone clasts; one reason could be that strong currents pulverized the softer limestone clasts. On the northern plains east of the continental divide, there were no mountain ranges to divert the flow. We have already calculated strong east-to-northeast flowing paleocurrents on the Cypress Hill, spreading sheets of quartzite gravel rapidly away.4 This could be why the cobbles and boulders on top of the Cypress Hills have the most abundant percussion marks of all the gravels. So, the quartzite gravels continued to be spread farther and farther eastward, over 1,000 km from their source. One can surmise that these currents were so strong that after the sheet of gravel was deposited over a much more extensive area than just the Cypress Hills area, erosion continued and eroded off hundreds of metres of sedimentary rocks, forming three more planation surfaces at different levels as the currents gradually channelized and waned at the end of the Noahic Flood. We believe the Cypress Hills and Flaxville Plateaus, remnants of the highest two planation surfaces, are probably the best areas to examine the strong evidence of the Recessive Stage of the Flood.6 The final erosion excavated the river valleys, sometimes dissecting planation surfaces. We hypothesize that the planation surfaces themselves represent the last fast, planar erosive flow in the area, in which case capping quartzites would be deposited as the flow waned. There could have been further linear dissection of planation surfaces by channelized flow. The mechanism for the formation of planation surfaces is similar to the mechanism proposed by Oard11 for the formation of valley pediments during the Channelized Flow Phase of the Recessive Stage of the Flood as the waters finally drained from the area. We are not sure whether the four general levels of planation surfaces represent four pulses of uplift of the Rocky Mountains or not. While the Rocky Mountains were uplifted, faulting caused the Columbia River Basalts to pour westward over Washington and Oregon from near the Idaho border. The quartzite gravels spread prior to, during and after the basalt flows, since some occur below, within and on top of the Columbia River Basalts. The gravels were likely spread by torrential flows off the Rocky Mountains.12,13 The large boulders found on top of the Wallowa Mountains with gold in the matrix indicate torrential currents.14 The quartzite cobbles and boulders often contain percussion marks, even as far west as Puget Sound. These percussion marks imply very strong currents, just as we discovered east of the divide.4 It all adds up to a consistent picture of diluvial waters running off the Rocky Mountains westward as the land rose at the end of the Flood, according to Psalm 104:4–8 (figure 3). As local mountain ranges, such as the Wallowa Mountains, uplifted, they lifted some of this quartzite gravel with them, which now exists on mountain and ridge tops. This huge sheet of quartzite would be greatly eroded by tectonics and higher velocities in more channelized flow areas. This is why quartzite gravels are sometimes found at the tops of mountains and ridges, as well as at numerous locations in valleys and basins. Quartzite gravels were being transported and deposited into the Channelized Phase of the Flood, since they are found at a few localities in deep canyons eroded into the basalt. It is significant that an enormous amount of basalt has been excavated from the great river valleys on the Columbia River Basalts, such as the Snake, Columbia, John Day and Deschutes rivers. The Snake River Valley was cut about 630 m into the basalt. 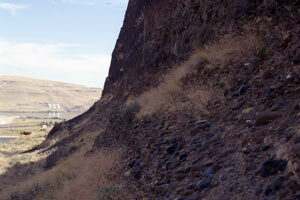 Quartzite and basalt gravels responsible for the excavation of the Snake River in southeast Washington are locally trapped by intracanyon basalt flows, such as at Lower Monumental Dam (figures 4 and 5). This vast erosion must have occurred during the Channelized Phase of the Flood because the great accumulations of eroded lava from these valleys cannot be found downstream toward the Pacific Ocean. The Channelized floodwaters can accomplish this task quickly. It is unlikely that this kind of erosion could occur in the post-Flood era. We believe that the Thorp Gravel around Ellensburg and Yakima, Washington and much of the Troutdale Gravel west of the Oregon Cascade Mountains represent deposition from the runoff of floodwaters from the Cascade Mountains. The Thorp and Troutdale gravels represent thick, widespread depositional sheets confined to valleys and consist predominantly of local volcanic rocks. This must have occurred in the Channelized Phase of the Flood because the main valleys had already formed. The gravels filling the valleys in the foothills of the Cascades were later partially dissected. Since most of the gravel is still intact after dissection, the geomorphology indicates that deposition and dissection occurred in late diluvial time. The gravels also indicate that the Cascade Mountains of Washington and Oregon were mostly under water until late in the Genesis Flood. Figure 6. 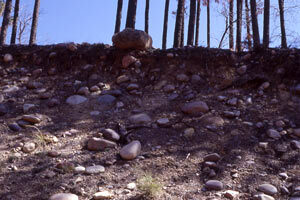 Gravels on top of the Mogollon Rim, southwest edge of the Colorado Plateau, above 2,200 m in east-central Arizona. Most of the large boulders are well-rounded, exotic quartzites, up to 1 m in diameter. Isolated boulder on top is a 2-m long local sandstone boulder. Figure 7. Close up of one large quartzite boulder with abundant percussion marks from the top of the Mogollon Rim in east-central Arizona. One important implication of this study for Flood models is the location of the Flood/post-Flood boundary. It is important to determine the Flood/post-Flood boundary because creationists can expend a lot of effort trying to explain rocks in a post-Flood environment that were really deposited in the Flood. Such a misinterpretation might cause some creationists to develop imaginative post-Flood catastrophic scenarios and retard the development and consensus of a geological Flood model. Geomorphology is a powerful tool for locating the Flood/post-Flood boundary. The erosion and transport over long distances by water of quartzite gravels can indicate where the Flood/post-Flood boundary is located in the northwest United States and adjacent Canada. The gravels are commonly surficial deposits or make up deep valley fills, so all the sedimentary rocks below them are from the Noahic Flood. These gravels are dated from ‘late Cretaceous’ to ‘late Cenozoic’. The gravels therefore indicate a Flood/post-Flood boundary in the late Cenozoic in the northwest states and adjacent Canada. Their association within and on top of the Columbia River Basalt Group indicates that these lavas extruded during the Recessive Stage of the Flood.16–18 The quartzite gravels on the top of mountains and ridges and deep in valleys, such as in northwest Wyoming, imply much late Flood tectonics. Similar Rim Gravels containing rounded quartzite with percussion marks on the high terrain of the Mogollon Rim in Arizona (figures 6 and 7) also indicate that the Flood/post-Flood boundary is in the ‘late Cenozoic’ in the southwest United States.9 The Flood/post-Flood boundary in the northwest United States and adjacent Canada is generally in accord with other information that indicates that the boundary is in the ‘late Cenozoic’ in many other areas of the world.14,19 But, each area must be examined individually on its own merits with multiple criteria. The quartzite gravels in northwest USA and adjacent Canada represent strong evidence for the Recessive Stage of the Flood with its two phases: Sheet Flow followed by Channelized Flow.5 The evidence adds up to transport by water,4 but we expect that transport may have been by mass flow at times, especially since strong erosion of subjacent material would have added much finer-grained sediment to the flow. The quartzite gravels in northwest USA and adjacent Canada represent strong evidence for the Recessive Stage of the Flood with its two phases: Sheet Flow followed by Channelized Flow. The gravels also tell us about the events in the later half of the biblical Flood. For instance, the first uplift of the mountains was likely in western Idaho and would automatically form a ‘continental divide’ in which the floodwaters would tend more and more to drain at right angles to the divide. Quartzite gravels would be spread generally as a sheet on a fairly flat surface. Then as the Recessive Stage of the Flood continued, more and more mountain ranges uplifted and adjacent basins sank. Some quartzite gravels would have been lifted to the tops of mountains and preserved at higher elevations, others would collect in basins or valleys and others would be washed away and entirely removed. The continental divide shifted eastward to where it exists now. In strongly down dropped basins in northwest Wyoming and northeast Idaho, the quartzite gravels piled up to over 3,000 and 4,000 m in thickness, respectively, forming pressure solution marks and fractures. Subsequent erosion removed most of the thick quartzite gravels in northwest Wyoming. West of the source area the transport of the quartzite gravels was mostly associated and contemporary with the great outpouring of lava from fissures in the earth. Finally, the gravels tell us that the Flood/post-Flood boundary is in the ‘late Cenozoic’ in the northwest United States and adjacent Canada. We thank Daniel Lewis for drawing figure 3. We thank Barbara Nye for drawing Figures 1, 5 and 19 in Part 1 and Figures 1 and 2 in Part 2. Oard, M., Hergenrather, J. and Klevberg, P., Flood transported quartzites: Part 2—west of the Rocky Mountains, Journal of Creation 20(2):71–81, 2006. Return to text. Oard, M., Hergenrather, J. and Klevberg, P., Flood transported quartzites: Part 3—failure of uniformitarian interpretations, Journal of Creation 20(3):78–86, 2006. Return to text. Klevberg, P. and Oard, M.J., Paleohydrology of the Cypress Hills Formation and Flaxville gravel; in: Walsh, R.E. (Ed. ), Proceedings of the Fourth International Conference on Creationism, Technical Symposium Sessions, Creation Science Fellowship, Pittsburgh, Pennsylvania, pp. 361–378, 1998 Return to text. Walker, T., A biblical geologic model; in: Walsh, R.E. (Ed. ), Proceedings of the Third International Conference on Creationism, Creation Science Fellowship, Pittsburgh, PA, pp. 581–592, 1994. Return to text. Oard, M.J. and Klevberg, P., A diluvial interpretation of the Cypress Hills Formation, Flaxville gravel, and related deposits; in: Walsh, R.E. (Ed. ), Proceedings of the Fourth International Conference on Creationism, Technical Symposium Sessions, Creation Science Fellowship, Pittsburgh, Pennsylvania, pp. 421–436, 1998. Return to text. James, W.C. and Oaks Jr., R.Q., Petrology of the Kinnikinic quartzite (Middle Ordovician), east-Central Idaho, Journal of Sedimentary Petrology 47(4):1,491–1,511, 1977. Return to text. Anderson, A.L., Drainage diversion in the Northern Rocky Mountains of East–Central Idaho, Journal of Geology 55(2):61–75, 1947. Return to text. Oard, M.J. and Klevberg, P., Deposits remaining from the Genesis Flood: Rim Gravels in Arizona, Creation Research Society Quarterly 42(1):1–17, 2005. Return to text. Love, J.D., Harebell Formation (Upper Cretaceous) and Pinyon Conglomerate (Uppermost Cretaceous and Paleocene), Northwestern Wyoming, U.S. Geological Survey Professional Paper 734–A, U.S. Government Printing Office, Washington, D.C., pp. A15, A21, 1973. Return to text. Oard, M.J., Vertical tectonics and the drainage of Floodwater: a model for the middle and late Diluvian period—Part I, Creation Research Society Quarterly 38:3–17, 2001. Return to text. Oard, M.J., Vertical tectonics and the drainage of Floodwater: a model for the middle and late Diluvian period—Part II, Creation Research Society Quarterly 38:79–95, 2001. Return to text. 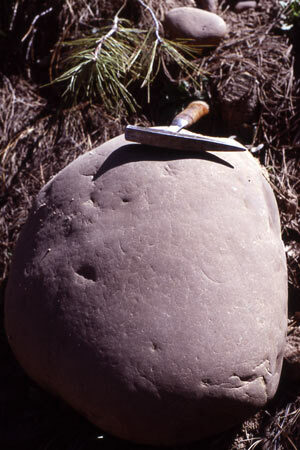 Allen, J.E., The cast of the inverted auriferous paleotorrent—exotic quartzite gravels on Wallowa Mountain peaks, Oregon Geology 53(5):104–107, 1991. Return to text. Oard, M.J., Where is the Flood/post-Flood boundary in the rock record? 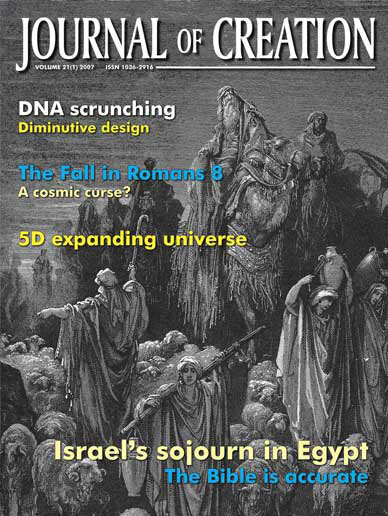 Journal of Creation 10(2):258–278, 1996. Return to text. Coffin, H.G., Columbia River basalts: Rapid submarine deposition (unpublished manuscript), 1996. Return to text. Woodmorappe, J. and Oard, M.J., Field studies in the Columbia River basalt, Northwest USA, Journal of Creation 16(1):103–110, 2002. Return to text. Holt, R.D., Evidence for a late Cainozoic Flood/post-Flood boundary, Journal of Creation 10(1):128–167, 1996. Return to text.